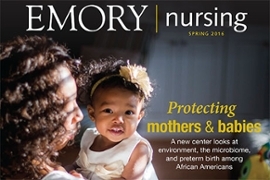 The School of Nursing recently released the spring 2016 edition of Emory Nursing. The magazine includes the latest news on the people, ideas, and research shaping the School of Nursing and the health care community. In this issue, you will learn about a new children's health center dedicated to improving birth outcomes for African American women, how diet may affect birth outcomes, and how nursing and midwifery leaders are expanding HIV services for mothers and children in sub-Saharan Africa. Read the spring 2016 issue of Emory Nursing.